Starting your varsity year will be a tad hectic, completing the admin, the registration, finding your classes and making new friends. Many of us feel anxious and often a tad fearful of the experience at first, creating a full mixed bag of emotions. 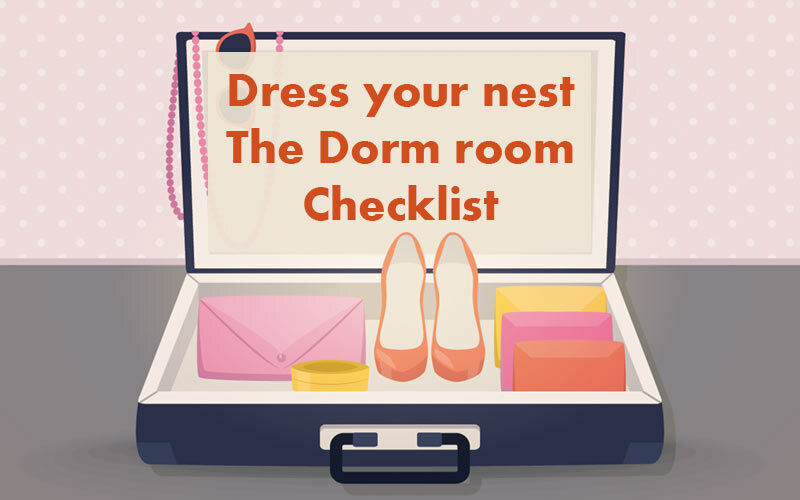 But nesting your dorm room or commune room shouldn’t be confusing, but rather fun and give you a sense of safety, for this is going to be your new home away from home;) Our dorm room checklist will give you a great start. Your student living space will most probably be far too small, keep small living, smart storage and minimal living in mind. Start by packing the essentials first, consider some home comforts and have fun dressing your dorm. I made you a dorm room checklist that you can use to ensure you don’t miss any of the essentials. You may not need doubles of everything, check with your roommate who brings what. Check if your accommodation provides a bed and mattress. If so make sure you get the correct sizes. Pillows, take enough, you can use them to make a makeshift couch from your bed. None of these are essential, but they will impact your successes at varsity. If any money could be spared it would be recommended to buy a well rounded Laptop and a cheap B&W Laser printer. This will be a time safer, stress safer and sadly safe an assignment or two throughout your varsity lifetime. Laptop. Consider your course requirements when making this purchase. B&W Laser Printer. A colour printer is handy, but a waste of money actually. Laptop / Tablet / Study Bag. Have one bag for all as you don’t want to carry like a mule. WiFi Router if you can afford. Anti Bacterial Hand Sanitizer, always use after class and labs. Extra Door lock – 2 Sets of keys. One for you and the other for your roommate. Sunscreen + Sun Hat 😉 Music festivals! Sewing Kit, even for the boys. These are mostly extras, but they will make live far more comfortable. Cable Splitters if you don’t want to share your TV with your roommate every night. Noise canceling Headphones! These are in my opinion essential for any long serious study hour sessions. They are pricey, but worth it. For the noisy Res & Communes. Remember the CABLES & CHARGERS!! Flash drive | Mini portable Hard Drive As big as you can afford. Post it Notes, these are essentials. We students always seem to find the space.